It is likely that all beer, wine and spirits labels will change dramatically in the near future. TTB has been working on new rules since CSPI and other groups submitted a petition in 2003. 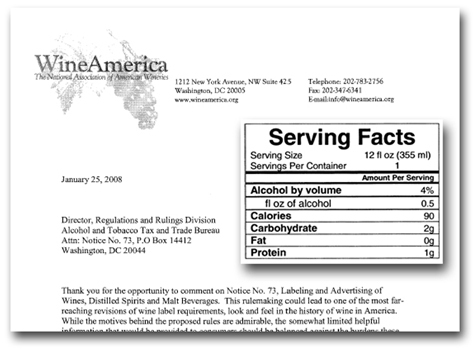 The new rules would require a “Serving Facts” panel on every container. This panel would include a lot more information, such as the typical serving size, number of servings per container, calories, carbohydrates, protein and fat. Because this is a big, controversial change, TTB has received more than 18,000 public comments during the past few years. There are far too many comments for most people to review, and so we will highlight and summarize the most noteworthy comments here. The most recent proposal and comments are here. This is comment 4 in a series; to see others, click on the “serving facts” tag below. Most common wines “fit into a very narrow band of calorie content per serving, about 120 calories” and this information is easy to find on the Internet. The rule could cause “information overload” and would provide “very little, if any benefit” to consumers. These changes would have “very negative economic effects” on more than 5,000 wineries in this country. Wine is more like fresh produce than manufactured food. It varies from year to year, lot to lot. Also, it is not consumed primarily for nutritional purposes. 98% of the nation’s more than 5,000 wineries are small businesses. It will cost these wineries about $2,000-$5,000 to redesign each label. The costs include at least $250 per sample for nutrient analysis. It will take about 2-4 weeks of waiting time per lab analysis. If TTB moves forward, TTB should allow the smaller, linear format.